House of Wolf is a curious place and one which undoubtedly will bring about diverse views. When I looked around this warren of a place, memories of taking ownership of my current house, a Victorian semi, some twenty-odd years ago came flooding back. We bought the house knowing that it needed a lot of renovation and that’s the kind of impression that House of Wolf gives, intentionally, I’m assured. I know people who would be fazed by a whole establishment that looks like ‘work in progress’ or perhaps ‘work about to begin’, but having lived through that I found much of House of Wolf’s presentation amusing, after all I don’t have to live there! Of course there’s a lot to be said for not changing things that have historical resonance and I’m all for keeping features where they can be kept. I understand from one of the managers that they like the distressed and worn in look and only employ people who love the place for what it is and have an enthusiasm for its quirky ‘style’, which makes perfect sense. The House of Wolf team like the word ‘experimental’ and yes there is some experimental stuff going on there, particularly in their cocktail bar, The Apothecary, where their cocktail menu, with monthly specials like the planned ‘smoked salmon martini’ are, potentially, boundary pushing. Their restaurant also claims ‘experimental’ credentials, playing host, as it does, to ‘pop ups’ rather than having a constant kitchen team. I’m not saying that’s a bad thing, in many ways it provides the opportunity for diners to go back time and time again and get an entirely different gastro-experience. The flip side is, of course, that you don’t know how good the next ‘pop up’ is going to be until you take a chance and try it. With planned residencies of about a month these short term appearances are likely to take time to become known to those who might like to try their cuisine. We went to House of Wolf on the first day of a four day pop up residency by Free Company. It was a set menu which started with doughnuts, would you believe? No ordinary doughnuts though, these light fluffy sweetened clouds were filled with a creamy stilton rather than jam, then lightly coated with caster sugar. The contrast between the salty blue cheese and the sweetness worked really well. Next up was scallops with cauliflower, walnut, celery and apple, the scallops were perfectly seared, buttery, juicy and sweet, the cauliflower also buttery had a good toasted crumb coating, contrasting well with the scallop, the nuts gave more depth and the small shreds of celery and apple gave good acidity that cut through the richness of the dish. This was followed by Iberico lard poached cod which was beautifully cooked, delicately translucent with great texture and flavour, this was accompanied by a piece of puffed crispy cod skin, a lovely tasty mussel chowder and some lemon puree, it was excellent and we loved it. The main was duck with chervil root, pickled pear and duck soup. The duck breast was perfectly reddish pink, juicy and tender and had great flavour, the pickled pear gave some good tanginess cutting through the rich duck and the duck soup had a good depth of flavour, having been well seasoned, and this gave a different dimension to the dish. Dessert was roasted banana, brown butter, lime and fromage frais. The banana chunks were sweet and soft, topped with a little caramelised sugar, the brown butter, essentially a scrape of toffee, brought a banoffee-esque touch to the dish, the lime and the fromage frais ices gave the dish some great tang and edginess that were a great foil for the sweeter elements on the plate. Finished off with a petit four cherry jelly coated chocolate truffle these were five excellent dishes from Free Company. This tasting menu was £40 and I imagine others would be similarly priced. I understand the idea is that pop ups will return from time to time, and I believe that Free Company will be going back, so look out for them. The constant in the restaurant is the wine list, which is reasonably extensive, but after the house wines, at about £20 a bottle, the prices rise quite quickly. Service was attentive and with constantly changing menus and kitchen staff, front of house need to keep on their toes. So all in all eating at House of Wolf is an interesting experience, for example, I was sat at a table where the wall in front of me was made up from bare laths with no plaster, whether they were original or not I have no idea, but it’s different. 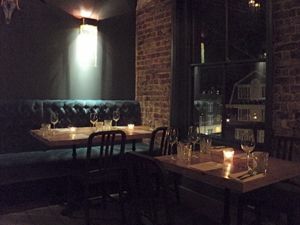 So, if you’re looking for something rather different from the norm, where each month you will have the opportunity to sample different cuisines and a new house cocktail, which range upwards from about £8, House of wolf might well be the place for you. For more information about what’s going on there go to the House of Wolf site, you might also be interested to see what Free Company are doing, their food was certainly quite innovative.